I still don't know what's wrong with irregexp yet. I plan to do more work on that over the long Labour Day weekend. The MIPS JIT also landed, which is important because it is the architecture Mozilla supports most similar to PowerPC. The MIPS JIT is little-endian, so we still have to account for that, but it's a more conventional RISC instruction set than ARM, has a link register, requires lui/ori to load 32-bit quantities just like we need lis/ori, and has similar requirements for branch stanzas. Moreover, it does not have the technical debt we have accrued getting our JaegerMonkey (Firefox 10-era) JIT working at all with BaselineCompiler, which is the basis of PPCBC; as it stands there are several bugs in full IonMonkey branching and bailouts I can't fix with our current implementation. The MIPS JIT gives me the chance to blow up everything and start over with a template that will be very similar for our own machines, but I have to get 33 working first. If we're really lucky, we can get this in for Fx38, if there is one. As mentioned multiple times, loss of 10.6 support would hurt us very badly. Mozilla will not do this until Google does in Chrome, though they have made some steps towards removal of support, the most important being that 10.6 is no longer supported as a build platform. (If you had hopes of me creating a TenSixFox, sorry.) The browser currently will still run on 10.6, but is linked against a later SDK. For their part, Chromium is tallying 10.6 specific bugs in their tracker as well as bugs hard to fix with 10.6 support, and it is possible that some future changes for 10.10+ will make it infeasible for them to continue supporting Snow Leopard. Generally this decision comes without warning, as it did for 10.5. I am watching these issues carefully. If the blade does not fall by 37 or 38, and Electrolysis is still not mandatory, we should make it. 31.1 will be out later this week with the scrollpad/Mighty Mouse scroll gestures fix, a tiny tweak to reduce JIT latency and some improvements to scrolling screen performance backported from Fx32 and 33. Ob10.4FxNews: about 50% done with the Firefox 33 patches. Not sure if it'll even build yet after the irregexp changes, but we'll see when I have the rest of the changes landed. One of the things that keeps our Power Macs relevant (besides this project, of course) is a steady stream of ready-to-use open source software; as even 10.6 becomes considered "legacy" this is an even greater concern. In fact, because TenFourFox depends on gcc 4.6 to build (a compiler never shipped with any version of PPC OS X) and various other tools, we wouldn't exist as a project without it. For years, getting such ported software meant MacPorts (what we currently use here at Floodgap HQ) and Fink, and lately Tigerbrew. However, other than Tigerbrew, which Misty DeMeo specifically targets at PowerPC OS X 10.4, both MacPorts and Fink no longer officially support PowerPC even on 10.5 or only do so on a best-effort basis. Whatever support exists is what's there modulo occasional port updates contributed by nice folks, and as a result I've lately started backing up /opt before I go updating a port lest I endure bustage I can't back out. More to the point, virtually no pre-built MacPorts binary packages remain for 10.4, so every update is an arduous and possibly fruitless build from source code. So I'm delighted to shamelessly pimp a new alternative which is also available, but based on a very old friend. If you are familiar with the BSD family (I've used NetBSD on 68K Macs and Power Macs since 2000, and to this day I have a NetBSD Macintosh IIci and Cobalt RaQ 1 providing critical services on the internal Floodgap HQ network), you are almost certainly already familiar with pkgsrc, which evolved from the FreeBSD ports subsystem to be the default package manager in NetBSD and is now available on Linux, proprietary Un*ces like Solaris, AIX, HP-UX and IRIX, and even MINIX, Haiku and Cygwin. pkgsrc has also supported Darwin and OS X since 2001, and at least in theory still should build packages on 10.4, but it's all going to be from source now too because the binary packages currently available are for -- you guessed it -- 10.6. And that's assuming they build. That's where Sevan Janiyan comes in: an up-to-date build of substantial parts of pkgsrc-current for 10.4/10.5 on PowerPC, with pre-built binaries saving you enormous amounts of time. Using his easy-to-follow instructions, install the bootstrap, set your environment up, and start pkg_adding your way to awesome. All the usual suspects are there, including Perl, Python, Ruby, gcc and lots of necessary libraries. Not everything builds yet, which is why not all the standard packages are available (besides the fact that a G4 Mac mini compiling any large project is generally a pedestrian affair). However, the mini so far has chugged through 1064 out of a queue of 2083 packages over the last week, and fixes are landing for the pieces that don't build yet. Not bad for a little white box on the shelf. The more package managers we have that work on PowerPC, and the more binary offerings we have available, the better off we'll be and the easier it will be to bring things back up if something fails. So thumbs up to Sevan for another alternative, along with the hard work Misty still does on Tigerbrew and our usual unsung suspects quietly keeping MacPorts and Fink still viable on the platform Apple wishes would just go away. My favourite Mac laptop of all time remains the PowerBook 1400, the first laptop I ever owned (I don't count the Commodore SX-64, which would be more likely to damage your lap) and my faithful companion for about five years as a hand-me-down from my brother-in-law, who had recently bought a snow iBook G3 and said that if I could fix the 1400, I could keep it. It turned out to need a new inverter board and LCD, so I just bought a whole new top case for $140 and his 1400c/117 lived again. Since then it picked up an Ethernet card (Nate had already installed a modem card), a new battery, an 8-bit video out card, a full 64MB complement of memory (supplemented by RAM Doubler), a 4GB hard disk and a 333MHz G3 and later a 466MHz G3 CPU board. I eventually transplanted most of it to a new logic board when the old one got flaky, and this reincarnated version still works great where it gets lots of weird looks at the local coffee shop because I put biohazard stickers on the clear cover. The 1400 has the best keyboard of any Mac laptop ever made, the highest marks for modularity and upgradability, and who doesn't like installing a different cover to match your mood? Evolutionarily, though, the NuBus architecture in the 1400 made it a dead end and I jumped directly from there to an iBook G4, so I never got to try anything between 9.1 and 10.4 on the road; in fact, I didn't move to OS X until the Jaguar days when I bought the last of the MDDs so I could still boot OS 9. 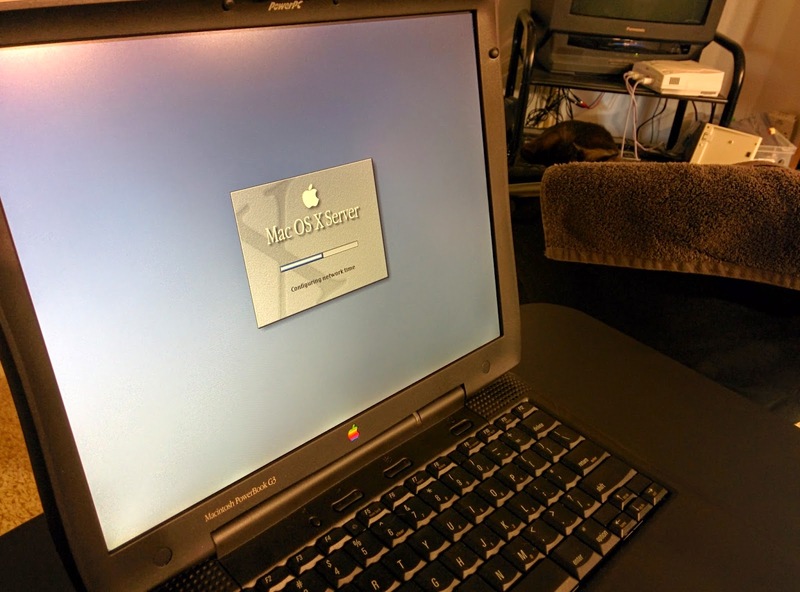 (Ironically, I wound up with Nate's iBook G3 too. It's in a bag waiting for a new backlight.) I never really got to play with Rhapsody back in the day, and when I found a set of Mac OS X Server v1.2 CDs on sale, I knew I had a use for another PowerBook I'd picked up along the way: a PowerBook G3 Wallstreet II, also known as the PDQ. This one was a university castoff from up in the Bay Area, where it was ending its days acting as a sync station for a Newton that had long since found another home. It was quietly leaked to me, where I refurbished it, cleaned up the case, got it a RAM upgrade and a new battery, and then put it in the closet and forgot about it until I discovered the Wally G3 was the best portable Rhapsody workstation ever made. Consider: it's bootable (hardly guaranteed with Rhapsody), it supports 24-bit colour at 1024x768, and it supports all the standard internal devices that Rhapsody did, including the optical drive and network. Previous G3 PowerBooks (and the 2400c, 3400c and clamshell iBook) only run at 800x600, and not only does the Lombard only work at 256 colours, you have to swap optical drives to get it to install and discs to mount if you have a DVD-ROM unit. 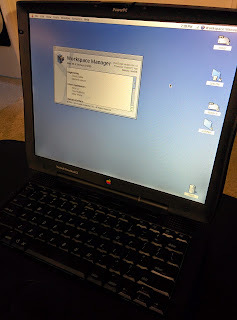 And you can forget about the Pismo or any G4 PowerBook -- it won't boot at all. 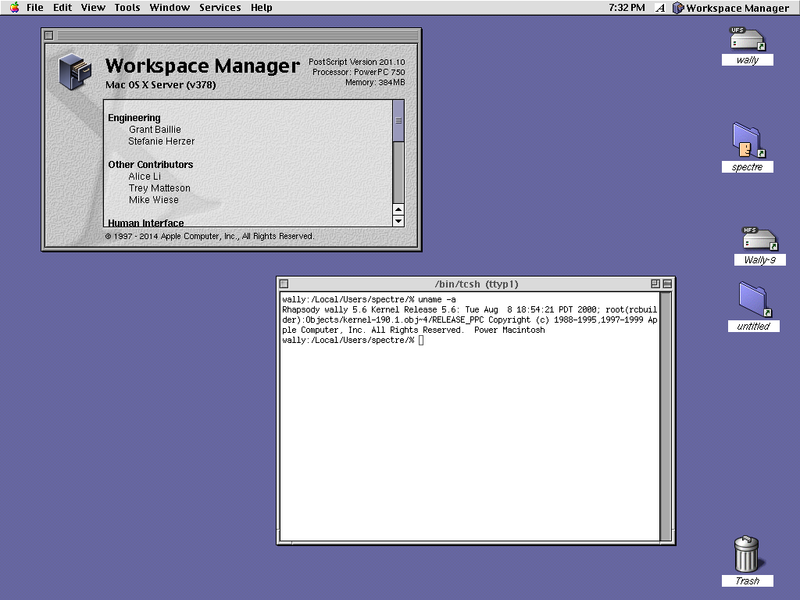 Rhapsody really is the closest thing to pure NeXTStep that ever ran on a PowerPC-based computer (NeXT never ported it to the Power Mac back in the day), but as you can see from the screen shot (besides the 2014 date which I swear is not Photoshopped; the OS apparently puts the current year in the copyright string) it does so with a not-quite-100% veneer of Platinum. I say it's not 100% because it puts a dot in the close gadget when a window is dirty, like NeXTStep and OS X both do but OS 9 never did; there is no true Finder in the Classic sense (certainly not the lovely spatial one we loved); and their Charcoal font has some peculiarities from the nice regular version in the real OS 9. But it makes the OS seem so clean and beautiful that I can almost forgive the ugly huge desktop icons. Having a mobile Rhapsody is great from a computing archaeology perspective. I don't have to dedicate a seat to it and I can throw it on a project table if I want to work with it. I theorize that the Apple developers wanted to do their work on a laptop too and snuck partial support in so that they could, and at least with respect to Rhapsody 5.6 (v1.2), it works well enough for that purpose. Which leads me to some annoyances about a portable Rhapsody installation specifically. First, there's no power management. The CPU runs full speed, no throttling, no cycling. There's no battery gadget for you to monitor how much time you have left (I'm sure there must be a way to check the battery through the I/O system, but I haven't found it yet). If you close the lid, the machine doesn't sleep, because there's no sleep support of any kind: you're either fully powered up or fully powered down. That's it. If the battery runs out, and like most PowerBooks of this age the PRAM battery doesn't hold much of a charge anymore, I found out the hard way that Rhapsody becomes unbootable (more accurately, PRAM gets whacked, and the first-stage bootloader is not a normal "Toolbox-style" Open Firmware booter, so the Mac fails to start the operating system). Fortunately, OS 9.2.2 can fix this. When I set it up to dual-boot, and the original battery was flat, it automatically started OS 9. I rebooted it once (if you don't do this, Startup Disk will hang) and went to the Startup Disk control panel, and it saw the Rhapsody partition and offered it as a choice. Whew! You can force the Rhapsody bootloader to boot something else by holding Option down as you power on the machine, by the way, and Rhapsody will see the OS 9 partition (just not vice versa except as a startup choice). It's interesting how dependent Rhapsody is upon Mac OS 9 to be fully functional, just like 10.0 and 10.1 were. There are also some other general annoyances with Rhapsody as a daily driver besides the dearth of software. In addition to the default Blue Box image being too damn small (after you run it for the first time, copy it from /Local/Library/MacOS/Users/your user name/StartupDisk.img to your OS 9 partition and let Disk Copy enlarge it; here are some tips on that), if you leave a CD in the optical drive when the machine boots, then you have to be root to eject it. This led to a lot of cussing until I figured out what was going on, which was worsened by the weird way the OS handles volumes (/Local?) and sometimes keeps ghosts of them around. And while the detachable menus are neat, they have a habit of detaching rather easily; fortunately Apple ditched this for the OS X Public Beta. But Rhapsody was revolutionary at the time, and I can see why. It almost promised a nearly seamless transition from the Classic age to the NeXT one, even with the same skin and basic appearance. It would be hard for me to work in it compared to OS 9, let alone Tiger, and I really need to do something about that compiler, at least, but now I've got a little Rhapsody to go when my curiosity gets piqued and I can enjoy what might have been any time I want. So here's to you, Wally. Job well done. Some of my recent numbers are causing me to consider my previous estimates unreliable. I'm retracting our previous statistics post and I will put up a revised one with hopefully solid numbers in a month or two when I am satisfied everything has settled down.